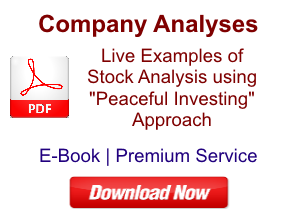 Home » Basic Concepts of Stock Analysis » Is Industry PE Ratio Important for Investors? 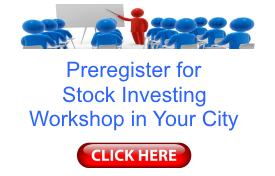 Buying a good stock at a cheap price, is one of the key pillars for making wealth in the stock markets. If an investor pays too much for the stock, then she may not make any money despite sustained good performance of the company whereas if she get a stock a deep bargain then even moderate performance by the company might provide her good returns. Every investor wishes to buy the stocks of companies at cheaper prices. However, each investor uses different criteria to assess whether the stock of a company is selling at a cheap or expensive levels. Some use price to earnings ratio (PE ratio), others use price to book value ratio (P/B ratio), dividend yield, sales to market capitalization for their assessment. One of the other criteria that commonly surfaces during discussion on valuations, is price to earnings ratio (PE ratio) of the industry. Different investors use Industry PE ratio differently in their stock selection process. Looking at the popularity of Industry PE ratio as a stock selection parameter, I have been repeatedly asked by many readers and investors about the importance one should assign to Industry PE ratio, while selecting stocks for investing. The current article is an attempt to elaborate my perspective on relevance of Industry PE ratio in the stock analysis. The article would highlight my views on importance and usage of Industry PE ratio in selection of stocks for investing. Industry PE ratio provides an idea to investors about the average PE ratio of all the companies in that industry, which are listed on the stock exchanges. There can be varied methods in which Industry PE can be calculated. 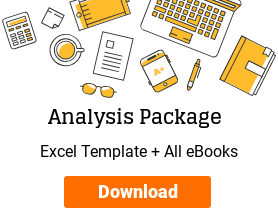 Some sources calculate it as a simple average of PE ratio of the constituent companies of the industry whereas some other sources calculate it as market-capitalization weighted average of PE ratios of constituent companies. Or simply, it can be the ratio of total market capitalization of all the companies in the industry to the net profits of all these companies. Some investors believe that companies operating in a particular industry would always have a PE ratio higher than other industries. E.g. it is normally perceived that companies operating in service industry would have a higher PE ratio than companies operating in manufacturing industry. Therefore, investors believe that it is ok to buy companies belonging to certain industries at a higher PE and assume that such stocks even at a higher PE ratio would provide same level of margin of safety than another stock trading at a lower PE ratio in a different industry. The underlying logic given is that manufacturing is more capital intensive than services and therefore consistent requirement of capital infusion in the business would be a constant drag on company’s resources leading to lower PE ratio. Within manufacturing it is assumed that certain companies like FMCG group would have a higher PE ratio than traditional/commodity companies like cement. Some investors believe that a stock trading at a PE ratio lower than its Industry PE is cheaply priced. The inherent assumption is that the selected stock deserves to be priced at the PE ratio of the industry. Investors’ belief also has the assumption that the PE ratio of all the stocks in the industry should tend to drift towards Industry PE ratio. This is called Mean Reversion theory, which indicates that the PE ratio of the stocks with PE ratio lower than Industry PE ratio, would rise and the PE ratio of stock with PE ratio higher than Industry PE ratio, would fall to the Industry PE ratio. Moreover, the Industry PE ratio data is readily available at various publically available sources of data like moneycontrol. 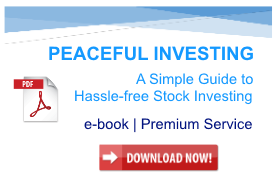 If an investor believes in using Industry PE ratio as a method of assessing the over/under-valuation level of any stock, then it provides her an easy checklist tool to decide about the valuation of the stock. Almost always, every industry has stocks spread across a wide range of PE ratios. This is true for any industry be it manufacturing or services. The following data about Cement, Cigarettes and Banking industry taken from moneycontrol for March 4, 2016, clearly illustrates wide variation in these industries. We can see that the range of PE ratios of the constituent companies, is very wide. 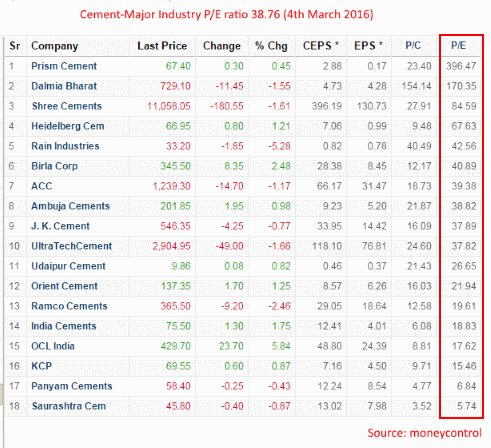 In Cement-Major industry, Saurashtra Cements Limited is available at a PE ratio of 5.74 while Prism Cement Limited is available at PE ratio of 396, whereas the industry PE ratio is 38.76. In Cigarettes industry, Raghunath International Limited is trading at a PE ratio of 3.80 whereas Godfrey Philips India Limited is trading at a PE ratio of 34.22, whereas the industry PE ratio is 26.24. 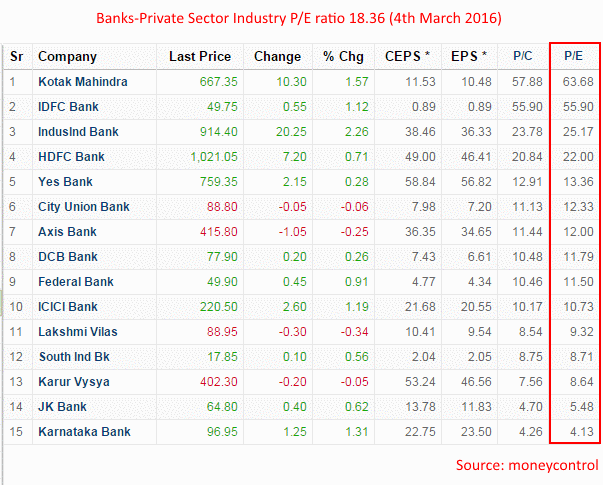 In Banking-Private Sector, Karnataka Bank Limited is available at a PE ratio of 4.13 whereas Kotak Mahindra Bank Limited is available at a PE ratio of 63.68, whereas the industry PE ratio is 18.36. This range of PE ratio of individual stocks within an industry, has always been very wide in the past and is expected to remain so in future. There would be stocks, which are constantly poor performing, which would keep selling at lower PE ratios and there would be stocks which are good performing and therefore would keep selling at higher PE ratios. There would be unrecognized stocks selling at low PE initially, which would show sustained good performance and become recognized later on and would sell at high PE. Similarly, there would be stock which performed well in the past and therefore sold at higher PE ratio, but over time have lost business advantage and started performing poorly. Such stocks would sell at low PE ratio going ahead. There would also be times when a stock whose business is declining, would see its earnings fall and after initial decline in PE ratio caused by commensurate decline in price along with earnings, would suddenly seem trading at high PE ratio when the fall in earnings (denominator) is much more than the fall in stock price (numerator). A time would come when the earnings would be NIL or negative and PE ratio would tend to be infinity! Therefore, an investor would notice that within an industry, there is no established norm that all the players would trade at a specific PE ratio, which many a times is assumed to be characteristic of that particular industry. PE ratio is dependent on the characteristics of the company. If a company performs good, then the market would reward it with higher PE ratio and if the company is not performing good, then the market would penalize it by lowering its PE ratio. 2) Stocks of good performing companies in an industry tend to trade at a higher PE ratio than the stocks of poorly performing companies even in supposedly high PE industries. An investor would notice that the PE ratios of good performing manufacturing companies do sell at a higher PE ratio than poorly performing services companies, whereas the common perception is that the companies in the asset light services industry should trade at a higher PE ratio than asset heavy manufacturing/commodity industries. An investor would observe that in the PE data of various industries shared above, established players in cement industry like UltraTech Cement Limited, Ambuja Cements Limited, J K Cement Limited etc. despite being in capital intensive manufacturing sector trade at a higher PE ratio (37-38) than their counterparts in the asset light banking industry like HDFC Bank Limited, Yes Bank Limited (PE ratio of 22 & 13.36 respectively). Moreover, if we compare the PE ratio of these good performing cement companies with poorly performing banks like J&K Bank, Karnataka Bank (PE ratio of 5.48 and 4.13 respectively), then the difference becomes further distinct. Therefore, the investor would notice that the PE ratio is dependent upon the business performance of the company and not on the industry to which it belongs. If the company selected by an investor performs well, then the market would reward it with a higher PE multiple, irrespective of the industry to which this company belongs. Many a times, investors believe that if a stock is selling at lower than Industry PE ratio, then it is cheaply priced and if it is selling at a higher PE ratio than Industry PE, then the stock is expensive. The underlying assumption by the investor is that the PE ratio of the stocks selling at lower than Industry PE ratio, would rise to the Industry PE ratio. Similarly, the PE ratio of stock with selling at higher than Industry PE ratio, would fall to the Industry PE ratio. However, there is enough evidence in the real life that basing investment decisions on mean reversion theory might not be a successful investment strategy. The most widely known & the biggest victim of investment philosophy based on mean reversion is the hedge fund Long Term Capital Management (LTCM). 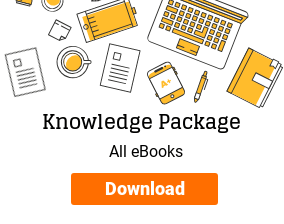 LTCM was managed by the most brilliant brains of current times including the noble laureates Myron S. Scholes and Robert C. Merton of the Black-Scholes-Merton model for options pricing. After studying the yield data of different investment instruments for past many years and analysing it statistically, LTCM based its investment strategy on the premise that yields of different instruments would always converge towards their historical mean/average. Therefore, LTCM bought the yield (took long position on the yield), whenever it fell below historical average and sold it short whenever it rose above the historical average. LTCM could make money through this strategy for about 4-5 years. However, during one such period in 1998, the yields did not revert to the mean. On the contrary, they kept on moving further away from the mean. No wonder, accentuated by its leverage, LTCM became bankrupt within a few days. Read: “When Genius Failed”: 9 timeless lessons from LTCM, the biggest investing failure in history! Therefore, an investor would notice that if she buys a stock trading at a PE ratio, which is lower than its Industry PE ratio, thinking that the PE ratio of her stock would rise over time to the level of its Industry PE, then she might be up for disappointment as such mean reversion may not happen at all. There might a possibility that such a mean reversion might happen eventually, but it may take so much time that the return in such a delayed scenario might not be attractive. 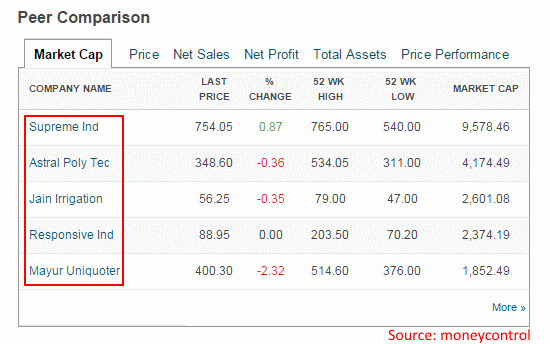 4) Industry PE ratio depends on the PE ratio of underlying companies and it’s not the other way round. Industry PE ratio is a derived number, which is calculated from the constituent companies either by a simple average or a market capitalization weighted average of their individual PE ratios. Movement of PE ratios of individual ratios would lead to increase or decrease in the Industry PE ratio. As mentioned in the point (1) above, the PE ratios of individual companies within any industry vary a lot and therefore, Industry PE does not influence the PE level of its constituent companies. Furthermore, I believe that if an investor is able to buy a stocks of a potentially good company at cheaper valuations (low PE ratio) in an industry, which currently has a low PE ratio, then in future, when the selected company performs well and the market assigns its stock a higher PE ratio, then this company would increase the PE ratio of the entire industry. Therefore, I believe that it’s the Industry PE that is influenced by its constituent companies and an investor should choose good performing stocks at cheaper valuations irrespective of its Industry PE ratio levels. A good performing company’s stock will make the industry PE higher, when market assigns it high PE (re-rates it), rather than the market penalizing its good performance by putting it at lower PE despite its good performance. 5) Industry PE ratio data might be erroneous as there might not be any specific industry in which a company could be classified. Many a times, a company might be operating in a niche industry, which might not have many players listed on stock exchanges. In such a case, the financial portals like moneycontrol might put it under any industry segment that might not be a true representative for its line of business. As the financial portals have fixed number of industries in their data sets, they assign the company to any industry, which the staff believes, is the nearest to the company’s line of business and the financial portals provide the Industry PE data for such a stock based on non-comparable peers. In such cases, the investors who rely on Industry PE for their analysis, might make erroneous decisions based on the irrelevant Industry PE data. As a result, an investor would observe that the Industry PE ratio of 31.53 (March 4, 2016) provided by moneycontrol for Mayur Uniquoters Limited, is not a relevant data point. An investor who takes an investment decision based on such erroneous Industry PE data, might, unknowingly, make an incorrect decision. Based on the above points, I believe that the Industry PE ratio for a company is not a significant parameter for stock selection. 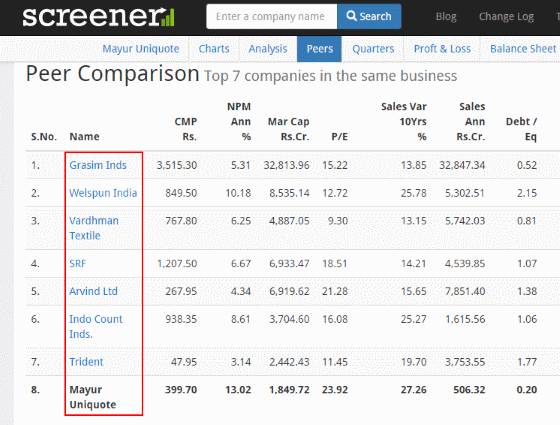 I ignore the industry PE data in my stock selection process, as I know that industry PE depends on its stocks and if the selected stock does well, then it will pull the industry PE ratio higher because of its sustained good performance rather than getting impacted by the poor performance of its peers. It might be erroneous to believe that stocks operating in a certain industry deserve to be priced at a higher PE when compared to stocks in other industries. We saw in the above discussion that good performing stocks get rewarded by the market by assignment of a high PE ratio irrespective of their industry. Therefore, I believe that an investor should focus on finding companies which are showing good growth in their sales with sustained profitability, are conservatively financed, are producing free cash flow from their operations and are cheaply priced providing a good margin of safety, irrespective of their industries. 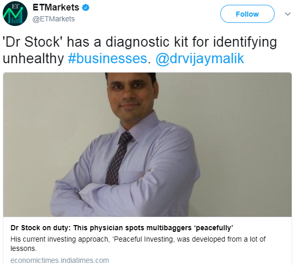 Similarly, the investor should not be willing to buy stocks of any particular industry on a high PE ratio merely because of the fact that the company belongs to that industry. The investor might face non pleasant surprises if the selected company does not perform well and lags its peers in terms of PE ratio whereas other good performing companies keep rewarding their shareholders both by way of higher earnings and resultant high PE ratios. Therefore, I believe that an investor should not focus on Industry PE and in turn should always focus on finding fundamentally good companies selling a cheap price, irrespective of industry. I would like to know about your stock picking approach and your views about usage of Industry PE ratio in stock selection. It would be a great learning experience, if you could share your experience of using Industry PE ratio, with the author and the readers of the website. You may share your inputs in the comments section below.